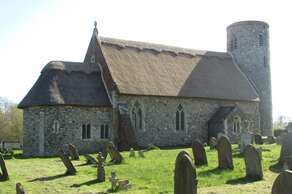 Recently rethatched, the exact age of fritton church is unknown. However its Saxon architecural features and strong links with King Canute indicate an age in excess of nine hundred years and it may have royal connections. We are located on the Angles Way walking route. To the south (4.5 miles/2 hours) you can stroll between Fritton and Somerleyton, on country roads, woodland paths and farmland tracks, passing flint built, thatched churches and the stunning Somerleyton Hall along the way. The Dukes Head in Somerleyton village makes an excellent finishing point.Alternately to the north (4.5 miles/2 hours), you can enjoy views of reed choked marshes and mills, finishing beside the River Yare and the impressive Roman fortress at Burgh Castle.A free pick up service is available for the tired and weary. Take a leisurely boat ride from our local boat yard, 800 yards down the hill next to the bridge in St Olaves. 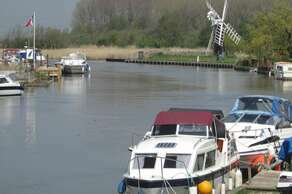 Cruise the River Waveney or River Yare, and stop off for a well deserved lunch at Reedham, Somerleyton, Oulton Broad or Beccles. Guidance is given by friendly boatyard staff. 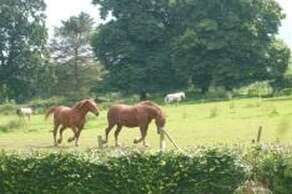 On the other side of the village you will find Redwing Caldecott Horse Sanctuary. Largest of the Redwing visitor centres, it is currently home to almost 120 horses, ponies, donkeys, and mules. Winner of various tourist awards and complete with gift shop, picnic area and cafe, you can be assured of a warm welcome. Disabled access, parking and toilets. Open Friday, Saturday, Sunday and Monday from10.00am until 4.00pm. Set in an 5000 acre estate Somerleyton Hall is widely acclaimed as one of the most beautiful and well preserved stately homes in Britain. Open to the public April to September this Tudor period Mansion and pleasure gardens complete with maze, plays host to events throughout the summer. Just a five minute drive away, this 17th century wedding venue has a par three golf course, putting greens, driving range, tennis courts, indoor bowls, a'la carte restaurant, bar and carvery, all in beautiful surroundings. Something for everyone.